ATMs are available in many parts of Buenos Aires - ensure you inform your bank before travelling abroad, and be aware you may be charged for cash withdrawals. It is advisable to exchange some cash before arriving in Buenos Aires. Visit the other Buenos Aires city guide sections to get more detailed travel advice, and information on the best Buenos Aires attractions and sightseeing activities, recommended shops and restaurants, as well as the best Buenos Aires hotels. Argentine Peso (ARS or $) divided into 100 centavos. 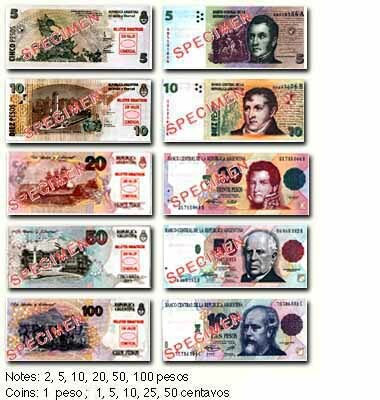 Notes are in denominations of 2, 5, 10, 20, 50 and 100 pesos. Currency can be exchanged at cambios (bureaux de change) and ATMs throughout the city and at Banco NaciÃ³n, a 24-hour bank in Terminal A at Eze International Airport. US$ and Euros are accepted in many restaurants and stores at a fair exchange rate. Pesos will be given as change, necessary for taxis and small purchases. Mon-Fri 09.00-15.00. Most banks no longer exchange foreign currency. Look for the BANELCO and LINK logos signifying ATMs. Withdraw odd amounts of pesos, say ARS90 or ARS190 rather than the obvious ARS100 or ARS200 from an ATM, thus avoiding receiving all your cash in hundred peso bills which are difficult to use for small purchases, on buses or in taxis as the drivers normally wonâ€™t have change, coins being scarce. Credit and debit cards are generally accepted by larger stores, hotels, restaurants and other tourist services, but you could pay a surcharge of up to 10%. Lower-end hotels and private businesses do not accept them. US Dollars and Euros are normally acceptable everywhere. Some international cards place limits on transactions. Cirrus cards sometimes aren't accepted. There are problems using travellersâ€™ cheques; shops will not accept them and only a few banks and cambios will exchange them while charging a big commission. If you do take them, get them in US Dollars to avoid additional exchange rate charges. American Express will cash travellers cheques with no commission at its central office from 10.00-15.00 Mon-Fri.
Visa (4379-3400; Av Corrientes 1437, basement).